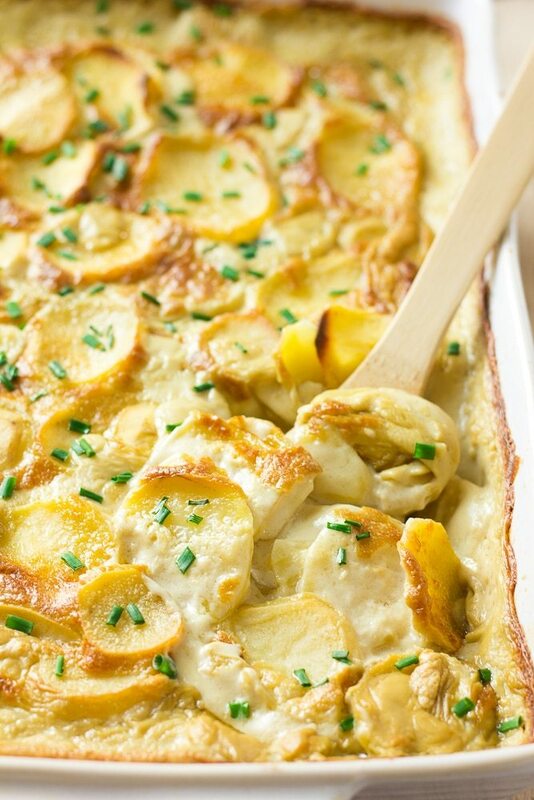 My favorite recipe for vegan scalloped potatoes- ultra creamy, cheesy, garlicky and comforting. 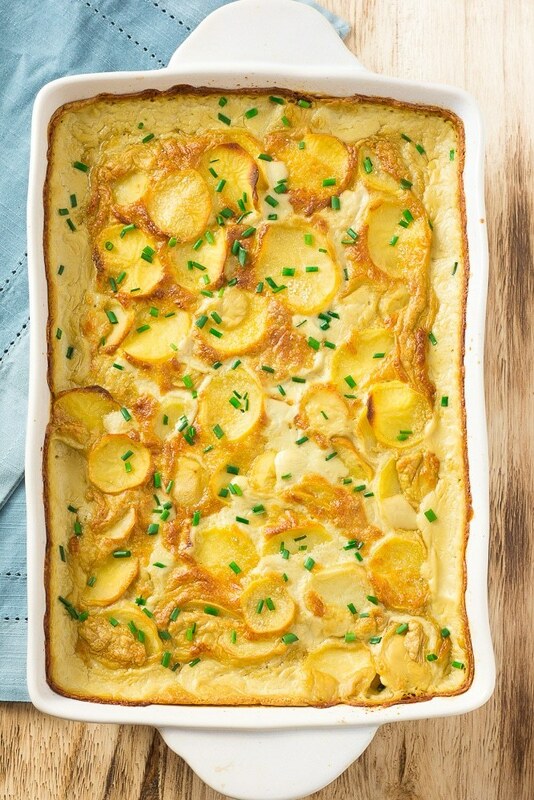 And this vegna scalloped potatoes is absolutely no dairy! These potatoes are so creamy, garlicky, flavorful and over-the-top delicious. The epitome of comfort food, and a must have at any holiday meal! They will be gone so fast, and no one will guess they are vegan. This vegan scalloped potatoes- ultra creamy, cheesy, garlicky and comforting. 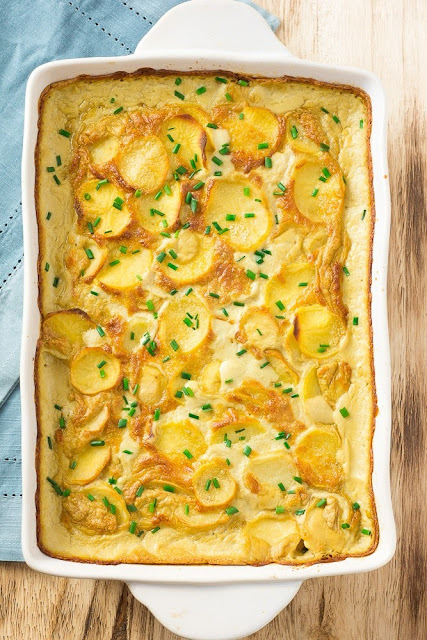 And this vegna scalloped potatoes is absolutely no dairy! Peel your potatoes, and slice them into 1/8 inch thick rounds. Preheat the oven to 400 degrees F and lightly grease a 9 x 13 inch baking dish. Set aside. Make the creamy sauce: In a high powered blender like a Vitamix, add all the sauce ingredients and blend on high for a few minutes until very smooth. Heat the olive oil in a large saute pan over medium heat. Add the sliced onion and saute for 3-4 minutes, until translucent. Now add the garlic to the pan and cook, stirring constantly for another minute. Turn off heat and set aside. Spread half of the sliced potatoes in the baking dish. Top evenly with half of the creamy sauce, and then add the onion/garlic mixture across the top of the sauce. Layer the rest of the potatoes, and then the rest of the sauce. Bake for 60 minutes, then check a few potatoes to make sure they are fork tender and cooked through. If not, put back in the oven for 10-20 more minutes, until done. The sauce should be bubbly and thick. Sprinkle vegan parmesan and chopped fresh chives on top, if desired and serve. Enjoy! May leave out the onions and garlic if desired, but they add a lot of flavor to the dish. I like using yukon gold potatoes in this recipe, but russets will work as well. Or try sweet potatoes for variety! Try to slice your potatoes similar levels of thickness; this will help them cook more evenly. If you slice your potatoes thicker, they will take longer to cook, so keep this in mind.